Lately I've been playing a bit of the squad-level strategy game Jagged Alliance 2 (both the original and the new "harder than killing a puppy in cold blood without guilt" Wildfire version.) I generally prefer turn-based strategy to real time strategy games, but thinking about some of the design decisions the JA2 guys made sparked some thoughts about the fundamental choices designers make when building these games. As you can see, it's hard to classify some of these games, and the more you think about it the harder it gets. For ease of simplicity, I'm explicitly declaring that games that allow you to pause the action are not invalidated from being considered "real time". 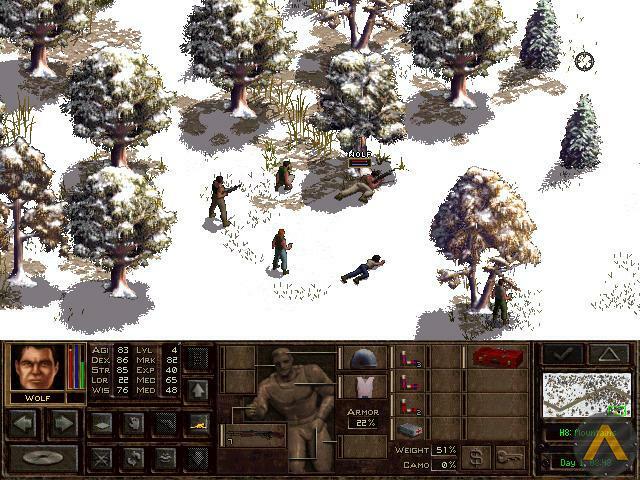 All computer combat games are turn-based in some internal implementation sense (e.g., in Warcraft your grunt will get a swing every X quanta of time). In my taxonomy, a game is "turn based" if those quanta are explicitly exposed to the user as "Now is the time when you must enter your orders, or your men will stand around, slackjawed, looking rather like 3D-rendered apes." AI, in other words, can turn a turn-based game into a real-time one. Neverwinter Nights implements D&D style turns and rounds, but if your avatar is attacked he or she will at least have some default "hit the monster back" type behavior. Likewise, Starfleet Command 2 is an almost direct implementation of the completely turn-based system from the Star Fleet Battles board game, but successfully hides its turn based nature from the player. So for me the vertical axis is the more interesting one -- simultaneity of movement. "Single move" means that in the context of the game, either the player is moving or shooting, or the enemy is, but not both at the same time. "Simultaneous" means that the enemy can be on the move at the same time as your pieces are. I find it interesting that most of the squad level games are single move. The compromise that most of them seem to have adopted is "only one piece moves at a time, but if the moving soldier moves into the field of view of an enemy who has movement points left, the enemy may get an attack of opportunity." I've never played Advanced Squad Leader, but I have a suspicion that that is exactly how it resolves combat. Any ASL experts want to enlighten me? 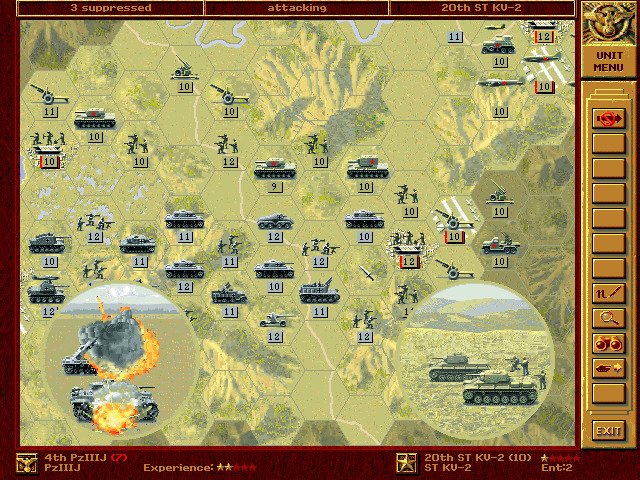 The battalion and division level games are more sophisticated; from as early on as Chris Crawford's Eastern Front, these games generally allow you to input orders for all your units, and then tell the computer "go." A notable exception is the Panzer General series of games, which essentially acts like the squad-level games in my list. I don't think it's coincidental that Panzer General is universally viewed as a more approachable, mainstream game than (say) Combat Mission. "One piece moves at a time" semantics aren't just easier for developers to implement, they are also arguably easier for players to understand. Somewhere deep in the darkest recesses of our medulla oblongata, "go over there and whack the other guy with a stick" is a concept we all understand. This is an intrinsic advantage of "move your piece" over "plotted movement" type games from a UI perspective: you click the mouse button and something happens. A piece moves. A little animation of a gunshot or an explosion plays. You whack the other guy with the stick. In a plotted movement game, the most that can happen is the computer can play a little happy sound that means "Yes, orders received." UI matters. This is a big hurdle for plotted movement games to overcome. Scale is another issue that may make it harder to implement simultaneous movement in a squad level turn based game. In a game like Combat Mission, the distance troops need to cover is large enough that they're generally not going to fly past each other by accident. A carelessly implemented squad level game could result in multiple rounds of combat with antagonists running past each other and then pirouetting around to fire off a shot. Yet if we're honest, the "move your piece" games suffer from their own class of problems: believability. This is less of an issue in the fantasy games, but it does stretch credulity in, say, Jagged Alliance when one of my men has enough action points to saunter up to an enemy and calmly fire a Desert Eagle into his face, and the enemy just stands there for the entire 10 second period because he had higher initiative and therefore has already moved and used up all of his action points. So even though plotted movement games have usability hurdles to overcome, I think it's worth trying to overcome them, because they bring greater realism -- of a sort -- to the player. Clicky-clicky games bring that realism also, but at the cost of requiring more dexterity and -- potentially -- less strategic thought (at least, that's the argument. I'm not actually convinced that this is necessarily true, but I'll put it forward for consideration anyway). Thus, I'd love to see more squad level games where combat is resolved simultaneously. I know of two, neither of which are modern. Both SSI games, Computer Ambush was a "squad leader" type game with a World War II mise-en-scene, and Galactic Gladiators (and its sequel Galactic Adventures) were based in the 28th century. Computer Ambush's user interface was terrible (for instance, to move, you told a soldier "MRdnm" where "d" was the direction, "n" was the number of squares, and "m" was the "mode" in which you were moving.) The Galactic games, to the contrary, stand up well even against today's best squad combat games. The interface is good for their era, and combat is quick and brutal. Rounds need to be short. The more orders you have to keep in your head before hitting the "go" button, the more confusing the experience will be to the player. The UI should encourage players to issue orders to squad members in terms of objectives and tactics, rather than in terms of controlling every step they take. It should be feasible to instruct a squad member "Get to this location on the map, moving cautiously and keeping under cover whenever possible" and not have them run out into the middle of a football field. Corrollary: A good pathfinding algorithm is a requirement. Corrollary: The interface needs to allow for a unit to report in for more orders if they get stuck or can't complete their objective. Likewise, instead of ordering "shoot at target X now," firing orders should be objective based: shoot indiscriminately to provide covering fire, only try to take out this target when you have a good shot, fire at anyone who approaches this area who you have a clear shot at. Or, instead of developing rules of thumb like this, maybe I should just see if I can find someone to fund me to produce Galactic Gladiators 2004. I see maybe a Bruce Willis in the main role, with Julia Roberts as the love interest. It'll have lots of heart. And a happy ending. I promise. A narrative history of Chris Crawford's Eastern Front. Crawford also has some interesting discussion of this game in his most recent book. An ancient review of Computer Ambush. Having previously been identified as your ASL acquaintance, I'll take a stab at identifying the parts of the ASL sequence of play that interest you. In the Prep Fire Phase, the Attacker (the player whose turn it is) can have some units fire and have their attacks resolved immediately at full strength. Other units can also be assigned to Opportunity Fire (i.e. "overwatch"). In either case, the units are then forbidden from moving in the next phase. In the Movement Phase, the Attacker moves units. If units start in the same stack, they may move together (usually to gain a bonus from moving with a leader or a tank). Otherwise, each unit moves individually and you must declare that you're done moving that unit/stack before going to another one, and you can't come back to it later even if it has MP remaining. I think this means that it falls into your single-move turn-based category. Simultaneously, the Defender (the player whose turn it ISN'T) is watching to see when he wants to fire. Each of the Defender's units basically gets one full-strength shot and one half-strength shot per opponent's movement phase. The Defender can "pause the game" after any MP expenditure by any of the Attacker's units to take those shots, and the results go into effect immediately, but he can fire *only at the units that are currently moving*. When the Attacker says that he's entirely done moving, if the Defender has any units which have not used their full-strength counterattack already then he may have them use that attack on anything, even if it didn't move. Of course, he may also fire at things that *did* move, but now he's lost the bonus for firing at a moving unit. Finally, in the Advancing Fire Phase the Attacker may now fire with any units that did not fire in the Prep Fire Phase. If the unit was predeclared as an Opportunity Firer, back in the Prep Fire Phase, it fires at full strength. If not, it fires at half strength or worse, even if it didn't actually move. The overall effect of this interplay being performed well is that of several games of "chicken" being played simultaneously. The Defender is (a) trying to save his good counterattacks for the juicy targets, while (b) trying to avoid revealing his defensive strength to the Opportunity Firers. The Attacker is trying to move his targets such that either (a) the Defender doesn't bother firing at all at something so puny because something better is still coming up, or (b) the Defender uses up all of his good counterattacks in a certain area, so further movement in that area can be performed at much less risk. Of course, after the Defender has withheld his attack that he was saving for the Attacking guy who obviously is carrying a satchel charge, the Attacker may end up not moving him at all. Or the Attacker may start off by sending a suicide squad straight at a clump of trees, and either he gets there safely or he reveals that enemies are there and the Opportunity Firers will get a juicy target. However, the most significant thing this description leaves out is the Rout Phase. The whole point of trying to arrange it so that your puny guys can move without interdiction is because of the rule that *broken infantry units can't move toward any known enemy, no matter how wimpy*. Far more infantry units die because they can't retreat than from actual fire attacks, and it only takes one guy behind the enemy line to make this happen. Oops, in rereading I realize that I didn't actually directly answer the question. The point is, the defensive capability of a good-order unit is mostly independent of its movement capability. Each unit will, on its non-moving turn, get an equal chance to "shoot back" if something comes within range. There was The Perfect General, which did a mixture of turn-based one-unit-at-a-time and simultaneous resolution. (3) something like the description of ASL above: a fire phase, a move phase, another fire phase, and all this with attacks of opportunity but one unit at a time.